COMMENTS: I used these molds for a wholesale order & was not disappointed. After a few minutes in the freezer, the M & P soaps released with relative ease. The molds bent a bit but nothing that renders them useless. COMMENTS: This is a good choice for the melt and pour honey soap base. I had a little trouble getting the soap out of the mold, but persistence paid off and it produced a nice finished product. COMMENTS: This design Lends itself very well to bees wax based lotion bars. COMMENTS: This is one of the cutest molds I have seen. I used it with honey MP and what a gorgeous soap it made. This is rigid plastic, so I did find it hard to unmold so I stuck in the freezer and shimmed them out like ice cubes. COMMENTS: I have had this mold now for a year and never had any problems removing my CP soap. Just put it in the freezer for 10-15 minutes before removing the soap. Cute design too. "I use this mold for my lotion"
COMMENTS: These fit just perfect in your hand! They are easy to unmold the lotion bars! And the design is cute since I use alot of beeswax in my bars! "Can't go wrong with Milky Way Molds!" COMMENTS: Milky Way molds are the best plastic molds out there! I haven't had a Milky Way mold break yet! COMMENTS: I really think that this design is really cute. It has great details without looking like it's too complicated or messy on the finished soap. The size is nice. This is a plastic mold, so you do have to be a little more careful with temperature and when you pop it out. Overall I think it's really cute! 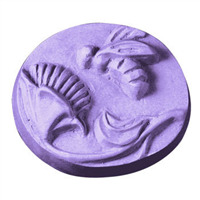 COMMENTS: I find this mold easy to use, easy to fill just the bee in a contrasting color, and easy to remove the soap from the mold. I like to take some sparkle mica and dry-brush it over the bee after the soap is set for a pretty presentation. COMMENTS: Favorite amongst customers! Nice size for handheld soaps! "Cute and made with quality"
COMMENTS: Very cute addition for all the bee lovers out there. COMMENTS: This makes a beautiful soap that fits nicely in your hand. It's the perfect size for samples or facial bars. I used all sorts of bases mixed with honey in this mold and each one popped out without a problem. I placed in freezer for quicker hardening and molds released product very well. Customers absolutely love the detail in the design. • Size is just right. COMMENTS: Durable mold which continues to yield perfect shapes. 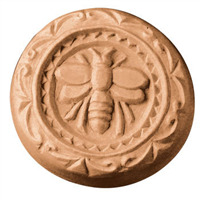 You can put differently colored soap in the bee indentation, or a little bit of cinnamon, and it will look just as good as it sounds. Almond or oatmeal/milk/honey are ideal fragrance choices. A great seller. • Allows for some very nice designs. COMMENTS: I used the oatmeal, milk, and honey fragrance with the clear melt and pour. Added some gold mica & voila! They turned out beautifully! COMMENTS: I use this mold to make my lotion bars. My customers love the motif, they just love the wee bee! Nice size for a lotion bar fits in the hand well and isn't too bulky to use. Bars pop right out of the mold easily which is a huge plus! 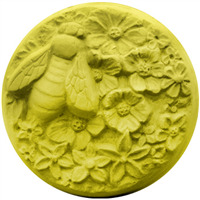 COMMENTS: The honeycomb soap mold is excellent my soaps unmold very easily..very pretty detail for my soaps. My customer's just simply love this soap! 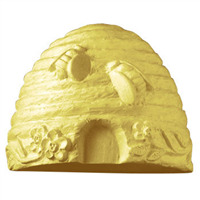 COMMENTS: This is one of the cutest honeycomb molds I've seen. Perfect for honey based soaps. "GREAT WITH HONEY BASED SOAP"
COMMENTS: THIS IS MY ABSOLUTE FAVORITE MOLD. I USE IT WITH THE HONEY BASE, GOLD SPARKLE AND HONEY ALMOND FRAGRANCE. FAMILY AND FRIENDS LOVE IT AND ASK FOR MORE!! COMMENTS: This is the cutest mold ever and easy to create a dripping-with-honey effect by overpouring the first layer and sucking up the excess with a dropper.